Click to enlarge. Closures planned for October 18 and 20. I am writing on behalf of Atlanta Gas Light to update you on activities around the pipeline installation at Hunting Valley Drive that will involve some road closures later this week. We recognize this is short notice but work in the area went more quickly than expected. 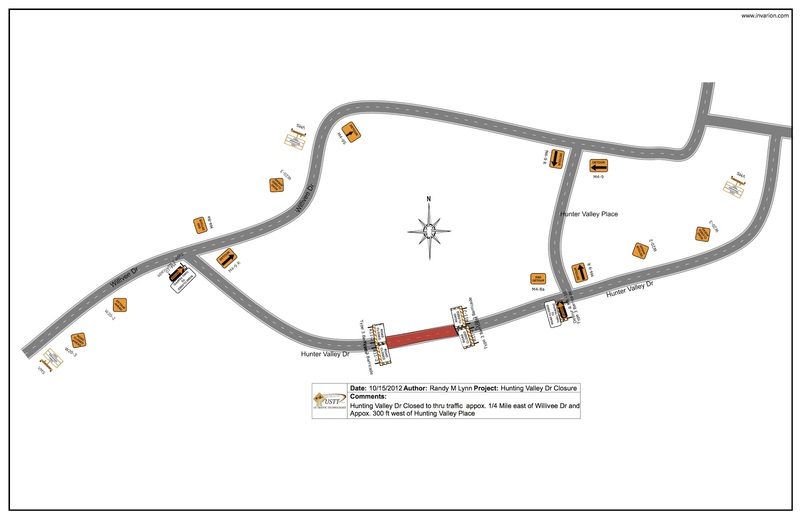 The contractor’s traffic plan is attached so neighbors can see the exact location of the closure and the planned detour around it. The drilling work at the site is almost finished, but to complete the installation, the contractor needs to cross Hunting Valley Drive twice with the pipeline shutting down a small section of the road during this process. The first closure is planned for this Thursday, October 18 and is expected to only last for a couple of hours or less. The second closure is set for Saturday, October 20 and could continue for up to 12-14 hours. Once this part of the installation gets underway, it cannot be stopped. Please be aware that this schedule could shift out by a day or two and possibly push the work to Saturday and Monday. Should it extend further into the week, we will reach out the neighborhood again. As noted on the traffic plan, signage will be posted in the neighborhood to alert pedestrians and motorists of the road closure. The areas around the drill sites will be cleaned up and temporarily stabilized once that work is complete in anticipation for the remainder of the pipeline installation currently scheduled to get underway in the neighborhood in December. Thank you very much for your help in getting the word out to the community during this brief disruption. We look forward to meeting with you all on Monday.